With a friend, wander around a museum without reading any of the information cards. When you find an object that intrigues you, ask your friend questions about it. It is important that you’re not shy about your curiosity. Ask your questions matter-of-factly—do not mumble or whisper. Ask multiple questions. Build a profile of the exhibit from your friend’s answers. Get them to tell them its name, purpose and cultural significance. The answers do not have to be accurate to reality. Take out a sharpie. Correct the information card to reflect the new reality you have created. Gamepoems are games that borrow from the form and language of poetry. They tend to be short, written games designed to evoke a feeling, mood or sense of place. There’s a good description of what they are here. Originally coming out of Nordic Larp, I’ve been part of a group of people making, exploring and sharing gamepoems. I have made gamepoems in response to the Wellcome Collection, about monopoly, to play on a walk, about my home town, and to play over time with a friend. 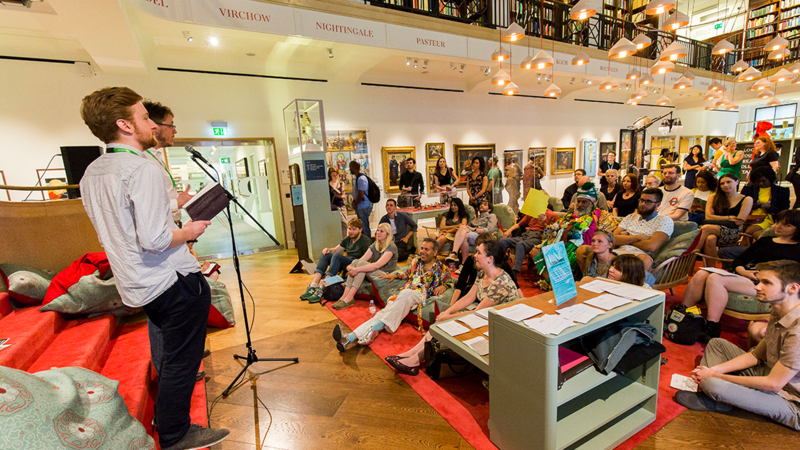 I have done talks and workshops about gamepoems at the Wellcome Collection Lates, A Maze Berlin and Feral Vector – giving a history of the form and teaching others how to make them.